SHOJAEIAN, S. , NAEENI, E. S. , DOLATSHAHI, M. , KHANI, H.
The presence of reactive component of current in transmission lines causes adverse impact on the network, including power losses, reduction of line capacity, and voltage drop. These adverse impacts can be reduced by using the first or second generation of FACTS devices. In this paper, these adverse impacts can be reduced optimally by using one of the modern optimization techniques, i.e., particle swarm optimization algorithm (PSO algorithm). By using this algorithm, the optimal size of the static VAr compensator (FACTS devices) in a 30 bus IEEE test system is determined. At first, the load flow equations of the 30 bus IEEE test system is defined in the MATLAB software by means of dynamic programming method, and the number of SVCs will be determined by using the system sensitivity function (power losses and the sum of buses voltage drop square); then, the optimal sizes of the FACTS devices is obtained by means of PSO algorithm. Y. Ou, and C. Singh, "Assessment of available transfer capability and margins," IEEE Transactions on Power Systems, Vol. 17, No. 2, pp.463-468, 2002. K. S. Verma, S.N. Singh, and H.O. Gupta, "Location of Unified Power Flow Controller for Congestion Management," Electric Power System Research , Vol. 58, pp 89-96,2001. S. Gerbex, R. Chekaoui, A.J. Germond, "Optimal Location of Multi-type FACTS Devices in a Power System by Means of Genetic Algorithm," IEEE Trans. on Power Systems, Vol. 16, pp. 537-544, 2001. W. Ongskul, P. Jirapong, "Optimal allocation of FACTS devices to enhance total transfer Capability using evolutionary programming," IEEE International Circuits and Systems, Vol. 5, pp. 4175-4178, 2005. M. Moghavvemi, M. O. Faruque, "Effects of Facts device on Static voltage stability," TENCON 2000. Proceedings, Vol. 2, pp. 357-362, 2000. R. Minguez, F. Milano, R. Zarate and A. J. Conejo, "Optimal Network Placement of SVC Devices," IEEE Transactions On Power Systems, Vol. 22, No. 4, pp. 1851-1860, 2007. J. Kennedy, and R. Eberhart, "Particle swarm optimization," IEEE International Conference on Neural Networks, Vol. 4, pp. 1942-1948, 1995. S. Das, A. Abraham, A. Konar, "Particle Swarm Optimization and Differential Evolution Algorithms: Technical Analysis, Applications and Hybridization Perspectives," Advances of Computational Intelligence in Industrial Systems Studies in Computational Intelligence, Vol. 116, pp 1-38, 2008. S. Naka, T. Genji, K. Miyazato , and Y. Fukuyama, "Hybrid particle swarm optimization based distribution state estimation using constriction factor approach," Proc. of International Conference of SCIS & ISIS, Tsukuba, pp. 1-6, 2002. D. Sedighizadeh, E. Masehian, "Particle Swarm Optimization Methods, Taxonomy and Applications," International Journal of Computer Theory and Engineering, Vol. 1, No. 5, pp. 486-502, 2009. I. A. Erinmez, "Static Var Compensators," Working Group 38-01, Task Force No.2 on SVC Conseil International des Grands Reseaux Electriques (CIGRE), 1986. H. Amhriz-Perez, E. Acha, and C. R. Fuerte-Esquivel, "Advanced SVC Models for Newton-Raphson Load Flow and Newton Optimal Power Flow Studies," IEEE Transactions on Power Systems, Vol. 15. No. 1, pp. 129-136, 2000. 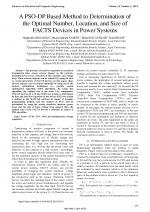 E. V. Larsen, C. Bowler, B. Damsky, S. Nilson, "Benefits of Thyristor Controlled Series Compensation," International conference on Large High Voltage Electric Systems (CIGRE), Paper 14/37/38-04, September 1992. 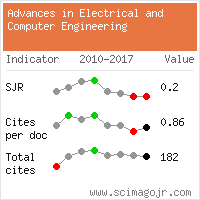 Citations for references updated on 2019-04-22 03:50 in 77 seconds.